The remnants of the President Merchant Mill after the 1881 fire. Undeterred, Kauffman constructed a new mill, this time out of brick and outfitted with a sprinkler system. This left many with the impression that the new mill would be fireproof.8 It suffered the same fate as the previous mill on March 2, 1895. This time two dust explosions, occurring within a few seconds of each other, spread fire across the mill instantaneously. Despite the attempts to prevent another devastating fire, the mill was once again destroyed, as the mill’s sprinkler system was overwhelmed by the speed of the blaze and was itself damaged by “falling machinery and timber.”9 The loss this time was estimated to be around $200,000. 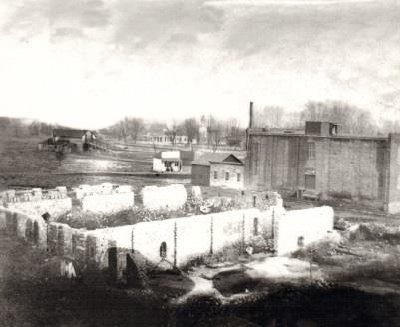 The sentiment among the citizenry was mixed concerning the rumors of rebuilding, with the Alton Evening Telegraph reporting favorably while The Edwardsville Intelligencer was more ambiguous.10 This was the end for the mill. Despite plans to rebuild, the Kauffman Milling Company eventually abandoned the plan and built a new mill in Kansas. By the time the President Merchant Mill was destroyed for the final time, its output had reached 360,000 barrels a year, though some acknowledge that the mill and the industry itself was waning.11 The daily average around the time of the explosion was as high as 900 barrels a day, which would have been even higher had the smaller mill machine been operating. Instead, it was being remodeled. Due to the remodel and the mill starting to ship in sacks instead of barrels, only twenty men were employed full time rather than the eighty that would have otherwise been required. Bethalto’s role in the grain industry was never as substantial in the 20th century as it had been in the late 1800s. The village’s last grain elevator would close in 1936, and the final vestige of Bethalto’s mill industry burned to the ground in 1986 when the last building from mill era was destroyed in a fire. By that point, the building had been a hardware store for decades.12 In the meantime, the railroads that had made Bethalto such a prime location for the milling industry had also vanished, leaving behind a quaint and completely deindustrialized village. 1. arrow_upward History of Madison County, Illinois: Illustrated, with Biographical Sketches of Many Prominent Men and Pioneers (Edwardsville: W. R. Brink & Co., 1882), 419; “Destruction at Bethalto, Ill., of a Mill, an Elevator, and Several Other Buildings, Entailing a Loss of $140,000, with Insurance of $60,000,” Chicago Tribune, 24 August 1882, column 6, p. 2; Centennial Historical and Publicity Committees, Souvenir History for the Bethalto Centennial, 1854-1954, September 3-6, 1954 (Bethalto, IL: R. L. Claussen Agency, 1954), 7-8. 2. arrow_upward Ibid. ; Jeffrey W. Allsman and Mayor Steve A. Bryant, Bethalto. (Charleston, South Carolina: Arcadia Publishing, 2013), 18, see image on the bottom-right of page. 3. arrow_upward History of Madison County, 419. 5. arrow_upward Centennial Historical and Publicity Committees, 8; Chicago Tribune. 6. arrow_upward Centennial Historical and Publicity Committees, 8. 9. arrow_upward Ibid. ; “Bethalto Mill Burns,” The Edwardsville Intelligencer, 15 March 1895, column 3, p. 1. 10. arrow_upward The Edwardsville Intelligencer; “Bethalto,” Alton Weekly Telegraph, 7 March 1895, column 1, p. 8. 11. arrow_upward The Edwardsville Intelligencer. 12. arrow_upward Allsman and Bryant, 21-22. Cite this article: Phil Schneider, "The Mill Fires of Bethalto," Madison Historical: The Online Encyclopedia and Digital Archive for Madison County, Illinois, last modified February 12, 2019, https://madison-historical.siue.edu/encyclopedia/the-mill-fires-of-bethalto/.